Good article today by an old friend about Bader. JL does his usual comp thing w/ pretty charts and shakes out a few exciting and a few terrifying comps for our Hollywood CF'er. I think his analysis is spot on and returned a few names that I had not considered. Keirmaier is the obvious comp. But, Stubbs and Jayson Werth are excellent finds as a positive and negative comp. I'm going to take a harder look at Bourjos and his career path a bit below, but first, read the article for yourself. If I have one complaint about JL's approach to these articles it's that he does not include MiLB data. He allows small sample sizes from the majors to set the parameters for his comps. That's fine, but your first 250-500 PA's at the majors don't usually define a player more than a few thousand PA's in the minors. So, let's consider Bourjos as a comp from a minor league perspective. Bourjos, in the minors, never really walked much and while his K rates weren't as high in the minors as they ended up being in the majors, they weren't exactly pretty. What stands out is the ISO and SLUG%'s and how Bourjos achieved those. Bourjos routinely had ISO's in the 140-150 range with one bump up to the 180s when he arrived in AAA (and had a corresponding BABIP hump). Slug%'s were routinely above .400, with his AAA year approaching .500. The trick is that Bourjos did not create those slug%'s or ISO's with HR power. Or really any power. He created them with pure speed. He had 36 triples in his final three seasons in the minors before breaking in compared to only 26 HR's (averaging below 10 per season). Do triples translate to the majors? Not for Bourjos. The one year (2011) that Bourjos produced the season that brings him into a comp with Bader, he squeezed into 3rd 11 times. From that point forward, it would take him until 2016 to accumulate 11 triples total. In the minors, Bader routinely had ISO's that surpassed Bourjos' high. He was over .200 at every long-stop in the minors and landed at age 23 with a .186 ISO in AAA. Don't worry, 3b's weren't part of his equation. In the minors, Bader put the ball over the wall quite regularly for a speedy CF'er. So, if Bourjos is JL's Boogeyman comp for Bader, I think all we have to worry about is whether Bader's HR's don't ghost Bourjos' 3b's. That seems unlikely considering Bader already has 15 career 4 baggers in just 519 MLB PA's. Projections also agree. They aren't willing push Bader over 20 or give him ISO's comparable to his MiLB numbers (all very understandable), but they have him between 15-19 in less than full time PA's, and with WARs in the 2-3 range. Bader, on the other hand, is being given the keys to CF and a vote of confidence to do what he has done his entire career: outperform his projections. 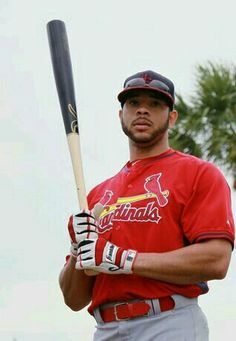 I'm also not saying Bader will be a star but I think the Cardinals' approach with him relative to Bourjos is going to produce a much better outcome, especially considering Bader now has a track record in the organization of rising to the next level, seizing the opportunity, and putting in the work to improve his weaknesses. Now... I have no doubt that Bader is a great defender. I just don't know how much we can trust that he's ELITE yet, if that makes sense. Is he merely good, or can he maintain that Bourjos/Kiermaier level for a few years? If he does that, then we can start to buy in to 2018. If not, he probably lands closer to Schierholtz or Stubbs. I also have a decent feeling that Jeff Albert can unlock a little more value out of him at the plate. You'd expect his plate discipline stuff to improve anyway- that's what happens with players as they age- but now, maybe he finds a little more with Albert's tutelage. Long story short, there are a lot of moving parts thinking of Bader's next few years. I should also add that putting that article together made me feel a lot better about Bader's future. I kind of expected to feel worse. If a mid-level result for him is Drew Stubbs or Schierholtz, or something in between Stubbs/Schierholtz and Kiermaier/Werth... that's a pretty useful player. And potentially a very good player. Good to see you around! I have enjoyed your articles over at VEB just as much as I did your posts here. Content over there seems to be improving, and is getting closer to "must read" territory. That's a big deal as I think PD coverage has generally declined lately and the Athletic is not filling the gap as well as they have in other sports/teams. Well done. There should definitely be some concern that Bader's +19 DRS, +17.2 UZR/150 in the OF won't hold up. It's simply very hard to perform at that level. He's going to play CF almost exclusively. He's going to face a full MLB season grind. He's not trying to claw his way into a lineup, so he might not be quite as motivated. All of that could cut into his performance (though the move to CF will lower the replacement level baseline). Only 6 players in the majors have over 40 DRS total since 2016 -- over 13 DRS per season average. Only 22 have over 21 DRS -- 7 DRS average. Bader would be a top 5 defender in the league if he dropped to +13-17 DRS on average the next few years. He can be a great defender and even an ELITE defender and still lose a ton of value on defense compared to what we saw last year. A drop is inevitable. And I'm having trouble just writing off scouting reports that said Bader was good but not elite in CF coming through the system. At the same time, we saw what we saw and in defense with small sample sizes, that might be the best thing we have to go on. Bader was head and shoulders better than Bourjos as a defender, and I thought Bourjos was pretty good out there. Agreed. If anything, Matheny gave him too many opportunities. And we had Pham just raking in AAA, to make it all worse. Many fans hated Jay so much they acted like Bourjos was much better than he was. The problem with those who make Kiermaier comparisons is that Kiermaier had close to double the defensive output as Bader did in 2018 during Kiermaier's two year run of 4 WAR seasons. Bader will likely always hover around 90-100 wRC+ and that will sting a lot for big stretches of games. Would love to hear your opinion on if O'Neill would be the better bet at CF given his similar defensive output as Bader (at least according to Statcast and SSS) and both have the BB/K ratio problems but O'Neill's ISO trumps all. And if O'Neill gets to 8+% walk rate like he did after adjusting in AAA and slugging .711, you have to roll with him over Bader. Having both wouldn't make me too mad either. But I would like better overall hitters at the corner OF. Last edited by Big Amoco Sign on February 8 19, 12:49 pm, edited 1 time in total.